West Seattle neighbors got a shock Monday when Alki Bakery abruptly closed its doors. Apparently, the same can be said for employees of the popular Alki Avenue bakery/cafe, some of whom learned of the closure that night. Fans of the flagship location — an Alki Beach fixture for 25 years — are in mourning this week as they process the news. What prompted the closure? “Simply put, our lease on Alki Beach is about to expire and the economics of renewing the lease at a much higher rate does not work,” company CEO Kevin Piper explained in an e-mail. 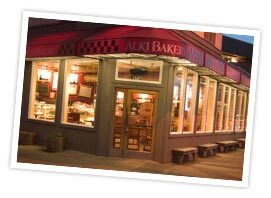 Alki Bakery says farewell to Alki. Three years ago, Alki Bakery, Inc. expanded into a 25,000-square-foot wholesale production facility in Kent, Piper said. The company has since put a greater emphasis on growing its catering division while providing and distributing baked products at retail locations throughout Western Washington, south to Portland and north to the Canadian border. UPDATE (Wednesday, 11/17/10, 1:14 p.m.): Read more on the subject via West Seattle Blog.